The staff and volunteers at KBEP seek to support and educate the community on all aspects of relationship violence prevention. Here are some of the ways that we are bringing awareness to the issue of domestic violence during the month of October. October 1-31: Throughout the month, we will be posting on social media about ways to prevent and respond to domestic violence. Be sure to stay connected with us on Twitter, Facebook, and Instagram. October 10: The KBEP staff will participate in Fall River’s Annual DVAM Commemoration and Flag Raising at Government Center. This event is open to the community. We hope to see you there at 1:00 p.m. For more information, click here. October 12: KBEP will be at Blend Cafe and Yoga in Somerset, MA for their Open Mic Night. Stop by our table to learn how you can support Domestic Violence Awareness Month. Click here for more information. October 18: We will be facilitating a webinar training about domestic and sexual violence in Black communities. This webinar is being hosted by the California Partnership to End Domestic Violence. If you would like to participate, register here. October 24: KBEP is hosting a screening of a documentary about the effects of domestic violence on children. This event is sponsored by the Childhood Domestic Violence Association. There will be food, prizes, and activities. This event is free and open to the community. It will take place at the NeighborWorks C3 Center in Woonsocket, RI from 6-8pm. Click here to learn more. October 25: KBEP will be at the Stop and Shop Health & Wellness Fair. We will be sharing resources about domestic violence at the Stop and Shop Distribution Center in Assonet, MA. Stop by between 12:00 p.m. and 4:00 p.m. to learn more, and to check out some of the other amazing resources that will be there as well! To commemorate DVAM, the Domestic Violence Awareness Project launched the #1Thing campaign. Each of us can do something to prevent, respond to, or raise awareness about domestic violence. 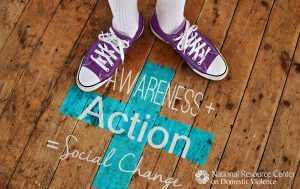 Share on social media how you plan to take action for Domestic Violence Awareness Month and be sure to tag us. We hope to have your participation in these events! ← Educator Profile: Meet Rowan, our newest KBEP Educator!